For forty years, municipalities, nonprofits, and community organizations have turned to the Conway School for design and planning assistance. Conway provides community design and planning services under contract and at cost, primarily for municipal and non-profit organizations. If your community or non-profit agency needs design or planning assistance, perhaps a team of graduate students from the Conway School can help. Contact Kristin Thomas by email to learn more. A thorough study by Conway students, under the direct supervision of professional staff, will help the client/community identify and articulate problems, analyze and assess basic resources, organize and present relevant data, clarify and prioritize goals, identify stakeholders, improve communication among community groups and boards, provide access to new resources, and provide models of successful design or planning projects; and as a result, raise citizen and community awareness about important environmental and planning issues. Conway students meet with their clients to talk about next steps. “The technical help you provide was just what we needed. You were able to change an unmanageable problem into an interesting project that has many Sherborn residents thinking seriously about flexible zoning, land trusts, grants, and even land banking. Your report presented a huge amount of information with the perfect combination of text and maps to make the report a pleasure to read.…Everyone on our Open Space Committee…has been thrilled!” – Barbara Kantorski, Open Space Planning Committee, Sherborn, Mass. Design for resilience: food security plans, walkable communities, green burial, sustainable agriculture, planting plans for climate change, reducing chemical inputs through native plant design, stormwater infiltration, permaculture and forest garden design. 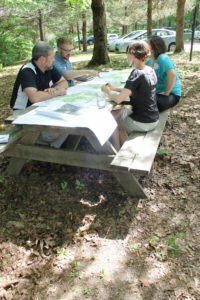 Open space planning: natural resource mapping, habitat restoration, open space and recreation plans, conservation planning and management, agricultural preservation plans, greenway studies, reclamation feasibility studies, town common and park design. Town master planning: historic district studies, streetscape renovations, village center revitalization, limited and/or cluster development plans, affordable housing, smart growth management, zoning revision, design review, regulatory evaluation. Site Design: analysis and assessment of physical features, context, client needs, regulatory restrictions; provision of design alternatives, phased development, cost estimates, and timelines; plans for building location, parking and circulation, grading and planting plans, management plans, conservation restrictions. Final report: written documentation of project process and recommendations, with reductions of maps and plans, in digital and print form. The school keeps client costs as low as possible. If consultants are used, their time is billed to clients at costs established in advance. No project fees are paid to students or staff. Travel expenses for projects outside of Berkshire, Hamden, Hampshire and Franklin counties in Massachusetts will be billed to the client. If a project offers exceptional or unique educational opportunities, we may be able to negotiate costs down from our regular rates. For details on project costs, please contact Kristin Thomas, Project Manager. Winter projects: Larger land use planning projects–municipal or regional in scale–are scheduled January through March; a comprehensive written report, with related maps and plans, is presented in print and digitally to the client. Spring projects: Community-scale projects, somewhat smaller in scope and more detailed in design, are scheduled April through June. A plan set, including construction drawings, planting plans, cost estimates, and other details depending on the project, is provided in print and digitally. Our guidelines preclude unfair competition with professional landscape architects.